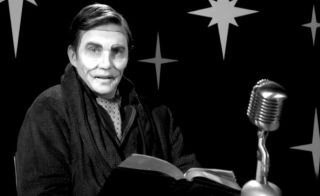 Compulsion Games has released a new live-action video in which Uncle Jack, the preternaturally happy (and creepy) face of We Happy Few, tells us an unsettling bedtime story about the Pied Piper of Hamlyn. "Nighty Night" is just one of a number of different live-action shows in We Happy Few that feature the smiling face of Uncle Jack. Compulsion has already recorded 32 different episodes, and more are planned if the Kickstarter can raise $315,000. That's a long way off—the campaign has drawn in $231,000 of a $250,000 goal, with seven days remaining—but I'd like to see it happen, because Jack seems like he has the potential to bring a lot of "flavor" to the game. The fairy tale is obviously an allegory for We Happy Few's backstory, which involves the citizens of Wellington Wells doing something so hideously awful during the German occupation of England in an alt-history Second World War that they literally invented a drug to help them forget the horror of their deed. Alas, the mystery remains intact; this is just the first half of the episode, and as usual, all the stuff we really want to know is in part two. The We Happy Few Kickstarter runs until July 4. Have a look at our hands-on preview from earlier this month to find out more about life in Wellington Wells.